THIS TANKARD IS DATED FROM THE LATE 70'S ----80'S TO SAY THE TANKARD IS ALMOST 40 YEARS OLD. TWIN HANDLED TANKARD /MUG. IT IS IN FAIR SHAPE, THERE IS A VERY SMALL CHIP ON THE BASE NO CRACKS. Two Wooden Beer Mugs - Tankards (unused). Fantastic item for collector or enthusiast. 2 X CORNISH CYDER FARM SMALL GREEN GLASS TANKARDS. 6cm TALL/4.5cm DIA AT TOP/5cm DIA AT BASE. MY REF:FUNNY FACE BOX. 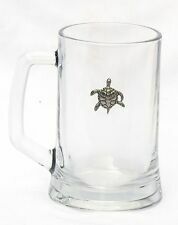 MARINERS COMPASS TANKARD. EXCELLENT CONDITION FOR AGE. 11.8cm high and 11.8cm wide at the top.In antique used condition with crazing. This is a stunning tankard, in bone china, and decorated with a knight on horseback. The legend reads "Thomas Beauchamp Earl of Warwick b. 1345". Gold edges to rim, base and handle. The pint pot holds over a pint (approx 600ml) so there is room for a good head. 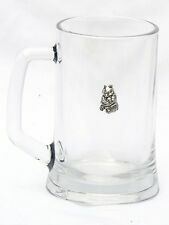 The heavy glass pint pot features a pewter emblem on the front of the glass. Heavy Glass Pint Pot. 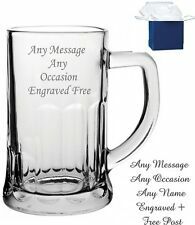 LEAD CRYSTAL BEER TANKARD-HALF PINT . Condition is Used. Dispatched with Royal Mail 2nd Class. 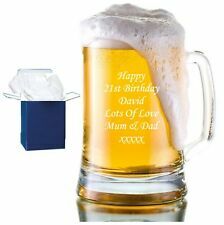 For sale is a modern style heavy glass beer tankard. Pint sized. Engraved Leaf Pattern. Unusual Twisted Glass Handle. 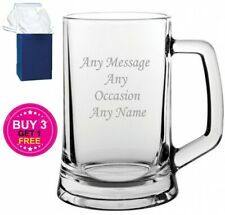 Glass tankard-style mug - great for Beer or Cider! Would make a lovely gift. NOTE: COLLECTION ONLY as I've had too many parcels broken - Sorry. CORNISH HEALEYS CIDER BOTTLE/JUG.WITH LID.IN GOOD USED CONDITION. VERY COLLECTABLE ESPECIALLY WITH ORIGINAL LID. William Widdup PEWTER TANKARD boxed . woodpecker handle. Any problems etc. Item sent 2nd class. Taunton Dry Blackthorn Cider half pint tankard in very good condition. Mini Scrumpy Cider / Cyder Tankard X4 Healys Cyder Farm. Condition is New. Dispatched with Royal Mail 2nd Class. Enjoy a variety of lagers and speciality beers with this stunningly handmade cut crystal Tankard - designed to help beers maintain a good head. Mould and Tool Marks. Usage: Cider/ Beer. When glass is perfectly homogeneous it does not contain cords.However,in practice,this state of absolute perfection is rarely achieved and slight differences in refractive index occur which are visible to the naked eye.Unless this effect is very pronounced it should not be regarded as a defect.